APPLY COUPON CODE ***(BLOWOUT)*** AT THE CHECK-OUT CART TO GET 50% OFF ANY PRODUCT OR COMBINATION OF PRODUCTS BELOW! "Step-By-Step Videos That Teach You How To Remodel Your Kitchen"
"It's Time To Put Your Tool Belt On"
Are YOU Ready to Tackle Your Kitchen Remodeling Project Yourself? Need a Little Contractor Hand-Holding? Well...You Have Just Found The Right Website. Training Videos On The Planet! More Than Our Share of Old Outdated Kitchens! 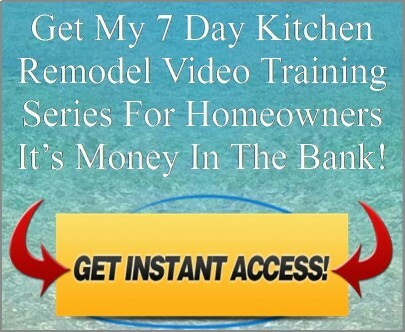 Remodeling Kitchens Into These Step-By-Step Training Videos. I Have ZERO Contractor Experience!? Was Once The "Old Kitchen". Incredible Living Areas In Your Home! These Step-By-Step HD Videos Are An Instant Download! NO SHIPPING! WATCH THEM NOW! YOU THROUGH THE ENTIRE KITCHEN REMODEL PROJECT. EVERY KITCHEN PROJECT VIDEO NEEDED TO CHOICE FROM. JOB LOCATIONS...IT'S AS REAL AND DOWN TO EARTH AS IT GET'S! THIS SALE ENDS IN JUST A FEW HOURS! Click On Any Item Below To Learn More! APPLY COUPON CODE ***(BLOWOUT)*** AT THE CHECK-OUT CART TO GET 50% OFF ANY PRODUCT OR COMBINATION OF MY PRODUCTS!